Summary: MR imaging–evident intraosseous channels associated with the presence of a dural arteriovenous fistula have been described in the literature. We describe these channels in relation to a case of dural arteriovenous fistula seen on CT. The presence of this subtle sign should be sought, and the area reviewed in all CT evaluations of patients with pulsatile tinnitus. Dural arteriovenous fistulas are uncommon intracranial vascular lesions whose characteristic feature is the shunt surgery of flow from meningeal arteries directly into the dural sinuses or leptomeningeal veins. MR imaging and digital subtraction angiography are used to confirm the diagnosis of dural arteriovenous fistula, with therapeutic potential existing in the case of the latter. The role of CT has traditionally been to elucidate the presence of any complications. We present a case report in which a patient presenting for assessment of pulsatile tinnitus was diagnosed with a dural arteriovenous fistula on the basis of the CT findings of resolving otomastoid fluid and the evolution of prominent transcalvarial channels. To our knowledge, these CT-based findings have not been previously described. This is a new sign of diagnostic significance because CT is often performed in the evaluation of pulsatile tinnitus, often despite a low clinical index of suspicion for the presence of a dural arteriovenous fistula. A 66-year-old man with a history of type II diabetes presented with bilateral otitis externa secondary to Aspergillus niger. 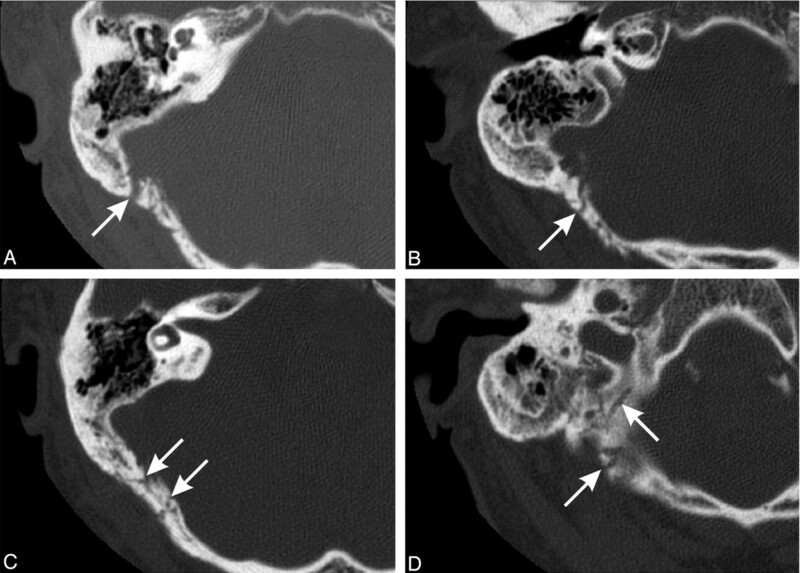 Because the right side failed to resolve, the patient was scanned with CT (Fig 1), which demonstrated fluid within the middle ear cleft, as well as opacified and poorly pneumatized mastoid air cells, possibly representing chronic otitis media and mastoiditis. Three months later the patient developed right-sided pulsatile tinnitus, with a clinically palpable right occipital artery. Cessation of the patient’s symptoms followed digital compression of this vessel and on turning his head to the ipsilateral side. A bruit was auscultated over this region. Further CT imaging (Fig 2) was noteworthy for the near resolution of the right-sided otomastoid findings and the new onset of multiple linear bony defects traversing both tables of the adjacent right occiput, consistent with a dural arteriovenous fistula. Axial helical CT section (1 mm) obtained through the right petrous temporal bone noteworthy for fluid within the middle ear cleft (arrow) and mastoid air cells (arrowhead). 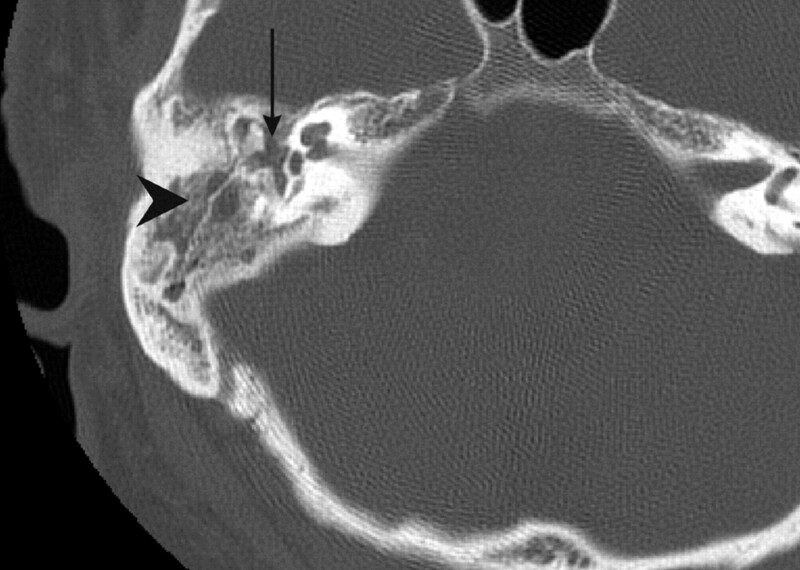 Axial CT images (1-mm helical sections) through the right petrous temporal bone demonstrating the transcalvarial channels (arrows). Note resolved otomastoiditis (images superior to inferior). MR imaging (Fig 3) demonstrated a tight stenosis at the junction of the right transverse and sigmoid sinuses on MR venography and a dural arteriovenous fistula of the right side of the occipital bone, connecting the sigmoid sinus to the occipital artery, on the corresponding MR angiography. Subsequent digital subtraction angiography, with a view to therapy, concurred with the findings on CT and MR imaging and successful embolization took place with excellent clinical and radiologic results (Fig 4). 3D time-of-flight MR angiograms depicting the prominent right occipital artery (arrowhead) and branches permeating through the squamous portion of the occipital bone (arrows), bypassing the previously noted venous stenosis. Note abnormal nonsaturated flow in the dural venous sinus (arrowhead; images superior to inferior). Selective digital subtraction angiograms of the right external carotid artery (oblique anteroposterior view). Injection of occipital artery (arrowhead) demonstrates transcalvarial channels (arrow) with early venous shunting into the patent dural sinus (asterisk) and ultimately flow into the internal jugular vein (early followed by delayed view). Dural arteriovenous fistulas are responsible for 10%–15% of all intracranial vascular malformations (1). They represent arteriovenous shunts (without a discrete nidus) located within the dura, usually involving the walls of large dural venous sinuses. Arterial supply is mainly via meningeal branches of the external carotid, internal carotid, and vertebral arteries, and drainage is into the dural venous sinuses or other dural or leptomeningeal venous channels. More than 50% of dural arteriovenous fistulas are located in the posterior fossa (2), with roughly one third being purely dural in origin. The pathophysiology underlying dural arteriovenous fistulas is poorly understood. Overwhelmingly most dural arteriovenous fistulas are acquired, developing as a consequence of thrombosis or obstruction of the dural venous sinuses. Predisposing factors include trauma, infection, hypercoagulable states, obstructing neoplasms, and vascular disease (2). The venous pathology appears to result in activation of neoangiogenesis with creation of microfistulas in the dural venous sinus wall. Ensuing turbulence results in intimal injury of the sinus, ultimately causing thrombosis, mural thickening, and worsening outflow stenosis (3). Additional arterial feeding vessels are recruited and further increase the degree of shunt surgery, resulting in retrograde venous flow and cortical venous drainage (4). Infection is a recognized predisposing factor to dural arteriovenous fistula formation (2). Mastoiditis may be complicated by either septic or aseptic inflammation of the adjacent meninges, in which the venous sinuses are contained. This localized form of meningitis, as postulated in this patient, may eventually be complicated by sigmoid sinus thrombosis. Intraosseous dural arteriovenous fistulas develop wherever emissary veins follow a transosseous path (5), usually with branches of the occipital artery. The mastoid foramen is located within or adjacent to the occipitomastoid suture, behind the mastoid antrum and adjacent to the sigmoid sinus. This important foramen transmits an emissary vein from the sigmoid sinus and a meningeal branch of the occipital artery, which may be large enough to groove the occipital bone (6). The most prominent transcalvarial channel identified in this case is most likely an enlarged mastoid foramen containing tortuous meningeal branches of the occipital artery. Contrast-enhanced CT is usually unable to depict dural arteriovenous fistulas (2), with MR imaging being the superior first-line investigation (7). CT is principally used to exclude complications, such as subarachnoid hemorrhage, intracerebral hemorrhage, and hydrocephalus and may sometimes demonstrate nonspecific findings, such as asymmetry of the dural venous sinuses or mild enlargement of the cavernous sinus or superior ophthalmic vein. However, in our patient, the development of prominent transcalvarial channels suggested the presence of a dural arteriovenous fistula. The superior soft-tissue contrast and multiplanar capabilities of MR imaging, combined with the ability to perform MR angiography and MR venography, make MR imaging the technique of choice in the investigation of pulsatile tinnitus (1). 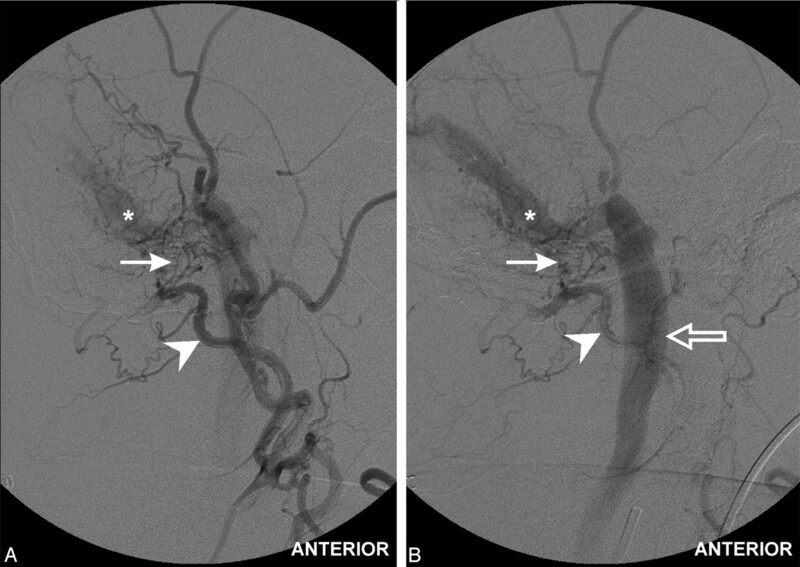 It is possible that some patients with a provisional clinical diagnosis of dural arteriovenous fistula but negative findings on MR imaging are eventually provided with an alternate diagnosis and thus are not offered conventional angiography, despite this being more sensitive in detecting dural atriovenous fistulas (7–9). The actual fistulous channels may not be detected using MR imaging because of their small size or the location adjacent to the dura and the lack of contrast between the signal intensity void within the fistula and adjacent bony structures (2). Common findings on MR imaging include an increase in size and number of extracranial vessels, visualization of transosseous collaterals, abnormal dural sinus flow, and stenosis or occlusion of dural sinuses (7). Uncommon findings include abnormal calvarial signal intensity overlying the dural arteriovenous fistula and tortuous vessels within the soft tissues beneath the skull base. Aggressive dural arteriovenous fistulas demonstrate dilated pial vessels, diffuse white matter edema secondary to venous congestion, diffuse cortical enhancement, and possible complications such as hemorrhage and infarction (10, 11). Assessment of cortical veins and dural sinuses is difficult because of the anatomic asymmetry of the venous system (9) and complex MR signal intensity characteristics of flow. Digital subtraction angiography remains the gold standard for the diagnosis of dural arteriovenous fistula. Selective studies of the external carotid, internal carotid, and vertebral arteries allow assessment of the morphology of feeding arteries, draining veins, cortical veins, and dural sinuses (1, 2). The involved dural sinus opacifies early because of shunt surgery of opacified arterial blood. Advantages of conventional angiography include improved identification of small dural arteriovenous fistulas, the opportunity for endovascular embolization, and the follow-up of previously embolized dural arteriovenous fistulas, which may show very slow MR imaging–occult flow (7). Treatment regimens available for the management of dural arteriovenous fistulas vary. There have been isolated reports of spontaneous closure of dural arteriovenous fistulas and closure after diagnostic conventional angiography. Some authors advocate the aggressive treatment of all dural arteriovenous fistulas. There is general agreement that aggressive dural arteriovenous fistulas are associated with an increased risk of hemorrhagic and neurologic complications (12–14) and that treatment of these lesions results in fewer complications, clinical improvement, and reduced T2-weighted white matter signal-intensity abnormality (secondary to resolution of venous congestion) (10). The goal of treatment is the total angiographic obliteration of the dural arteriovenous fistula. Transarterial and transvenous embolization can be achieved using various embolic agents such as polyvinyl alcohol particles, platinum coils, isobutyl-2-cyanoacrylate, and n-butyl-2-cyanoacrylate (4). Compressive therapy has been used for small benign dural arteriovenous fistulas, involving intermittent manual compression of the external carotid artery by the patient (4). Surgical disconnection of the dural arteriovenous fistula, using ligation and cauterization, is indicated when endovascular treatment is inappropriate or ineffective (4). Finally, stereotactic radiosurgery has been used for the treatment of some dural arteriovenous fistulas, though the slow improvement in angiographic appearances makes this treatment technique more appropriate for smaller benign lesions. 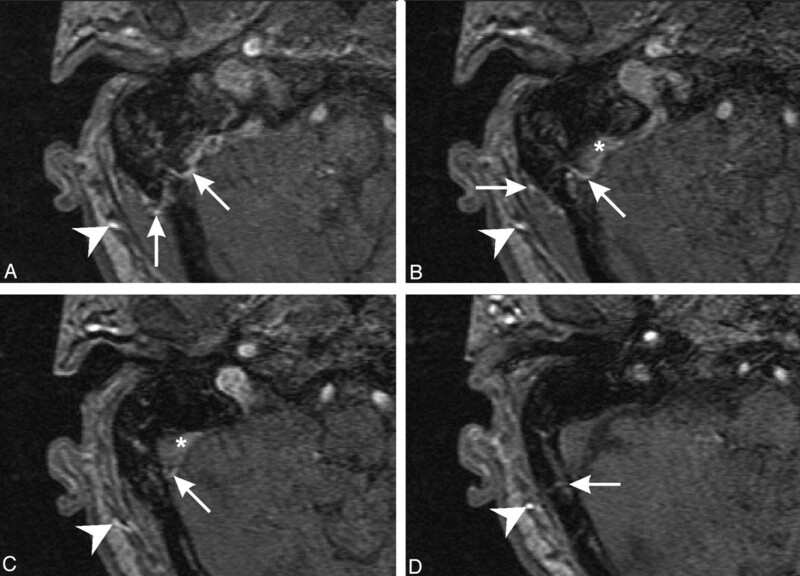 Pulsatile tinnitus may be secondary to a large number of pathologic entities, including dural arteriovenous fistula. CT is often the primary imaging technique used in the assessment of many cases of pulsatile tinnitus. The presence of transcalvarial channels is of diagnostic significance and may be detected on CT, indicating that further assessment with MR imaging and digital subtraction angiography is required. Accepted after revision December 13, 2004.